The Greek Isles is one of the most popular cruise destinations in the world. After all, there’s no better way to explore the islands than by cruise. Life in the Greek Isles is laid-back and relaxing. A vacation there should be, too. Nothing puts a damper on a trip like the hassle of packing and unpacking a suitcase multiple times, or the stress of missing the hydrofoil to the next island on your itinerary. When you cruise to the Greek Isles with Azamara you can explore the entire region, yet only unpack your suitcase once. You can enjoy incredible onboard amenities at night, and wake up feeling refreshed each day in a new, incredible destination. Explore all our upcoming voyages to Greece here. If you’re not sure cruising is for you, we’re here to show that not all cruises are created equal. Our late-night departures and overnight stays mean you’ll have more time to explore the heart and soul of each port-of-call. Onboard programming like enrichment lectures, culinary demonstrations, and wine tastings will enhance your onshore experience. After all, the onshore experience is the true star of the show. Not just the destinations you visit, but the people in them. The history, the culture, the food. Our shore excursions are designed to peel back the layers of each place we visit, to not only showcase local life but to immerse you in it. Close your eyes and picture a Greek island. We bet it’s Santorini that comes to mind. It’s a quintessential Greek island thanks to its beautiful whitewashed, cliffside villages, deep orange sunsets, and incredible panoramic views. It’s not just one of the most photogenic places in Greece. It’s one of the most photogenic destinations in the world. For the best photo-ops, head to the village of Oia. The ocean views, red volcanic sand beaches, blue-roofed buildings, and bright pink flowers are unparalleled. If Santorini sounds like a place you’d like to explore, browse our shore excursions. You can visit ancient vineyards, hike rugged volcanoes, sail aboard traditional Greek vessels, and more. If Santorini has a competitor for “most famous Greek island”, it’s Mykonos. Mykonos is another postcard-perfect destination, with its whiter-than-white houses with brilliant blue shutters, vibrant bougainvillea, and striking 16th-century Venetian windmills. Mykonos is known for being a friendly and popular LGBTQ travel spot, and also has a vibrant nightlife scene. Mykonos looks like a scene straight from a postcard: and a beautiful blue harbor drenched in warm sunlight. For one of the island’s most iconic views, visit the iconic 16th-century Venetian windmills. Beneath the idyllic scenery, Mykonos has a thriving nightlife scene and is a popular LGBT travel spot. Lucky for you, with Azamara’s late-night departures, you can let loose when the sun goes down! Mykonos offers something for everyone. Our shore excursions range from an exhilarating 4x4 off-road adventure to a visit to an ancient monastery, to food tours and beach days. Crete is the largest and most populous island in Greece. On the northwest coast of Crete, the ancient Venetian port city of Chania is a historian’s paradise. The mix of Greek, Venetian, and Ottoman influences is fascinating. It’s also a perfect travel destination for foodies, thanks to the cuisine’s use of fresh, local produce, unique Cretan cheeses, and famous local olive oil. Chania is also a perfect gateway to exploring other parts of the island. Shore excursions from Chania can take you to local villages and monasteries, the ancient remains of Knossos Palace, local Cretan wineries, or the island’s finest beaches. With a history spanning more than 10,000 years, Rhodes is a bucket-list destination for history buffs. It’s the largest and most historically important island of the Dodecanese group, and one of the best-preserved medieval cities in all of Europe. The entire city-center is designated a UNESCO World Heritage Site. If ancient history puts you to sleep, don’t fret—you’ll still love Rhodes. With more than 300 days of sunshine per year, the beautiful Tsambika Beach is hard to resist. In fact, there are plenty of ways to spend a day in Rhodes. In addition to exploring history or hitting the beach, our shore excursions include a guided bike tour, a pottery workshop, and more. Corfu is one of a few islands rumored to have been the inspiration for Shakespeare’s The Tempest (Bermuda is another). Once you’ve visited, it’s easy to understand why. The island is downright magical, with sparkling turquoise waters, gentle breezes, and the smell of olives wafting through the air. The island lends itself well to being explored on foot, by bicycle, or even by boat – and you can do it all with our shore excursions. Known as “the Hawaii of Greece”, Naxos is beloved as one of the lushest, greenest Greek islands. Olives, figs, grapes, potatoes, and other produce are grown in its fertile soil. The abundance of farmland gives Naxos a different atmosphere than islands with tourism-based economies. The mountains, ravines, and isolated beaches also provide a unique, recognizable aesthetic that sets Naxos apart from the rest of the Greek islands. Patmos may be small, but it’s a place of importance in the Christian religion – it’s where John the Apostle allegedly wrote the last book of the New Testament. Travelers interested in this should visit the Cave of the Apocalypse, as well as the Monastery of Saint John the Theologian. If religious history doesn’t interest you, Patmos is also home to Agriolivadi Beach and can be visited on a shore excursion. At less than four square kilometers, Delos is tiny. But when it comes to history and ancient ruins, it sure packs a punch. The island is a UNESCO World Heritage Site thanks to its impressive archaeological site. The remains of Hellenistic-era temples, statues, a theater, and more make the island a must-visit destination. While it’s not possible to stay on Delos, it’s easily accessed from Mykonos. Azamara guests can visit during a Cruise Global, Explore Local shore excursion. Kefalonia is the largest of the Ionian island group. Its main town, Fiskardo, is known as “the Saint-Tropez of Greece.” By day, beaches, caves, and a beautiful botanical garden inspire further exploration. Luxury yachts dot the harbor during high season, and the few historic Venetian buildings that survived a 1953 earthquake provide a picturesque backdrop. By night, the island lights up and locals and travelers alike hit the town’s cafes, bars, and restaurants. Skiathos may be the Sporades’ smallest island, but it is one of the most popular with jet-setters for shopping, swimming, and sunbathing. It’s most famous for its incredible beaches (of which there are more than sixty), which have pristine white sand and dazzling turquoise waters. If you don’t consider yourself a beach bum, Skiathos has plenty more to offer. Make your way to Kastro, a 16th-century medieval town. Overlooking the town is Chlemoutsi Castle, a well-preserved fortress and castle that dates back to the early 1200s. Avoid the hassle of packing and unpacking multiple times by exploring via a cruise. Choose an itinerary that includes the islands you’re most interested in visiting but allow yourself to be surprised by going off the beaten path as well. Look for itineraries that stay overnight in port, or depart later in the evening. You don’t want to be rushing back to your cruise ship to set sail before dinner! Select shore excursions that enrich your understanding of the destination and highlight local life. Each Greek island is unique, and your travel experiences should reflect that. Accept that you can never see and do everything in one trip. Take your time exploring, and if you love the region or a particular island, make plans to return. 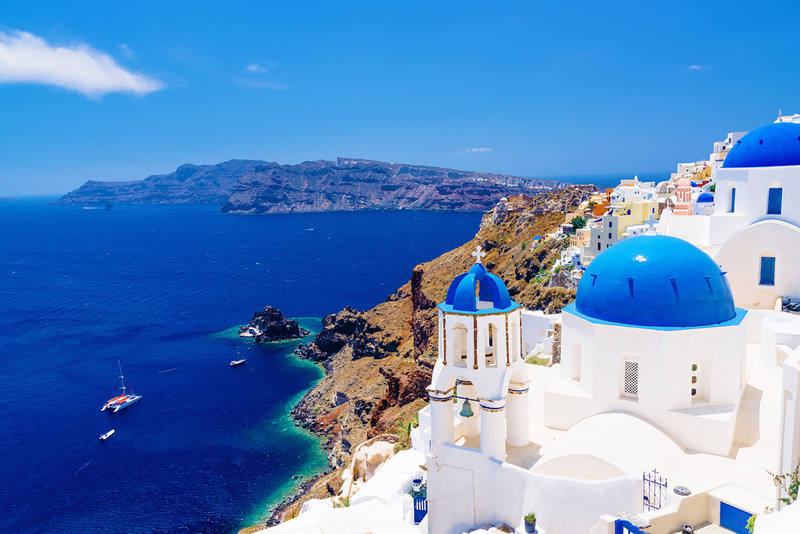 Browse our upcoming cruises to Greece, and join us onboard for a voyage! If you want to explore further in Greece and really immerse yourself in island life, our unique country-intensive voyages are your ticket to discovering the full picture of this incredible region.